It is almost hard to believe that the very same funding deal that President Donald Trump rejected in December when he drove the country into a partial government shutdown—and that Trump and all but six Senate Republicans rejected again last Thursday—is the one that Congress finally adopted unanimously and that President Trump ultimately signed the very next day. The pain the shutdown caused to approximately 2 million federal government workers and contractors, as well as to their families and communities, was literally all for nothing. With this deal, Trump temporarily caved on his commitment to shut down the government for “months or even years” if he failed to secure $5.7 billion for wall funding. 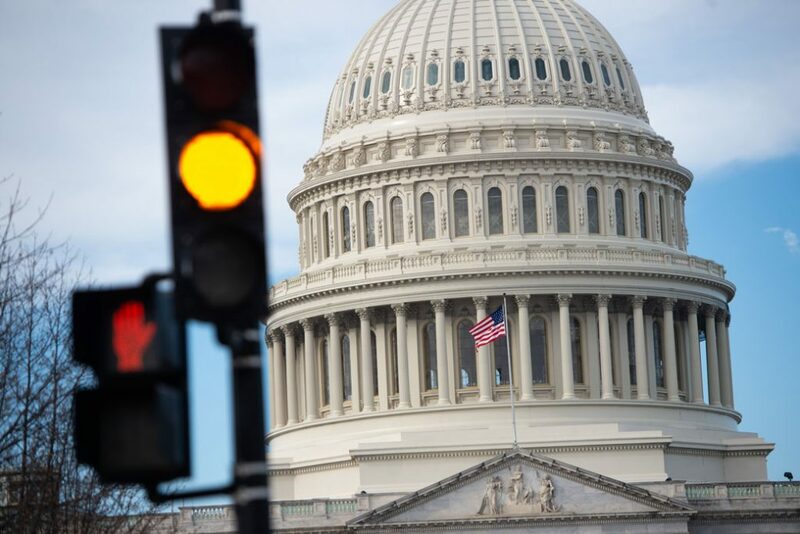 However, securing that funding remains his top focus heading into a bipartisan, bicameral conference committee that aims to produce full-year government funding legislation for both House and Senate consideration. With a new Congress and a bipartisan process underway, the government’s spending decisions should cease to be a de-facto blank check to the Trump administration. Funding levels should be based on the needs of the country overall and on the facts on the ground along the U.S. border—not on the president’s immigration lies. This column establishes what the ground rules should be for the negotiations beginning today and how this process can lead to a spending package that makes real improvements without sacrificing immigrant communities or humanitarian protections—all without blowing through established budget caps. First, Congress should assert its power of the purse. Throughout the Trump administration, the Department of Homeland Security (DHS) and Immigration and Customs Enforcement (ICE) have used budgetary tricks and deception to undermine Congress’ will and assert nearly unfettered authority to transfer or reprogram funds between accounts in order to grow the already bloated immigrant detention system. The conference committee should put an end to this practice. The final bill the conference committee produces should include a prohibition on the ability of DHS and its components to transfer funds between accounts in order to spend more than the amount appropriated for detention as well as other enforcement activities, including the wall. Such a prohibition should include explicit language directing the DHS inspector general to monitor spending from the account and, on a monthly basis, report to Congress the names of any individuals in the government who attempt to illegally spend more than the amount appropriated for immigration enforcement. Because these actions would violate the Anti-Deficiency Act, and Congress will have made clear that such actions are illegal, the DHS inspector general should be directed to immediately refer such individuals to the U.S. Department of Justice for prosecution. Second, even as Trump announced his intention to sign legislation reopening the government, he reaffirmed his threat to declare a national emergency and take money from other parts of the government to build his wall. While this would constitute an illegal action and potentially expose U.S. Department of Defense officials to prosecution, Congress should make clear that, in any deal, no funds may be used to build a wall through such an emergency authority and no funds may be used to seize (through eminent domain or otherwise) state, tribal, or privately held land to build the wall. Finally, the conference committee is not another venue for the president to hold the government hostage. The shutdown harmed 2 million government employees and contractors and cost the federal government billions of dollars. Conferees must agree to not politicize the process by adding poison pill policy riders that Congress has rejected over and over. These include any changes to asylum policy or to the Trafficking Victims Protection Reauthorization Act; attempts to water down protections for children by overturning the Flores settlement; and more. As the conferees are members of the House and Senate appropriations committees, they are quite familiar with the fact that, over the past 15 years, the United States has spent roughly $250 billion on immigration enforcement. Due to substantial investments over time, the Border Patrol now employs nearly 20,000 agents—nearly double the number from the early 2000s. Funding for detention beds has similarly skyrocketed. In total, the United States spends more on immigration enforcement than it does on FBI, Drug Enforcement Administration (DEA), Secret Service, and all other federal criminal law enforcement agencies combined. At the same time, apprehensions at the southern border—a proxy for overall undocumented immigration—remain at near-40-year lows. This is the backdrop against which negotiations should take place and the final bill must not cause further harm to immigrant communities living in the country or people seeking protection at U.S. borders. For starters, the fiscal year 2019 bill should contain no funding for additional detention beds and should reassert Congress’ prerogative to decrease detention capacity. This was Congress’ stated intention with the FY 2018 bill, which established detention funding levels that would “require ICE to reduce the number of detention beds.” Instead, ICE has since increased the average daily population by nearly 20 percent and, incredibly, added thousands of beds over the course of the shutdown. Detention funding should be decreased. Furthermore, the bill should contain no funds to increase the number of Border Patrol agents or ICE officers or weaken integrity requirements integral to the hiring process. Finally, the final bill should contain no funding to build an unpopular and unnecessary wall. So, what would real, durable improvements at our border look like? Immigration judges: There is bipartisan agreement that the current backlog of immigration cases—with more than 800,000 cases pending and average wait times of more than 700 days—is untenable. One way to speed up the current system and ensure that those seeking protection find a resolution to their cases (rather than being stuck in limbo) is to increase funding to hire more immigration judge teams. Improvements to ports-of-entry (POEs): Investing in technology and infrastructure at POEs is the smartest way to crack down on drug smuggling while also facilitating the movement of goods and people. POEs are where the vast majority of heroin, opioids, and cocaine that cross the southwest border come through. In the final deal, Congress should provide such funding to the General Services Administration (rather than DHS), which owns and operates the majority of POEs, including several now undergoing modernization and expansion. Medical care for kids: In December, two children died in Border Patrol custody, likely as a result of inadequate access to necessary medical care. Congress should mandate appropriate health screenings and medical care in CBP custody and appropriate funds so that child welfare professionals and trained medical personnel may be available in a timely manner at POEs and Border Patrol stations. These appropriations should be made without exceeding budgetary caps and growing DHS’s already mammoth budget. First, provide more funding to tackle the root causes of violence, insecurity, and structural inequality pushing these children and families out of Central America. Second, stand up in-country processing, like the Central American Minors program, to allow children to apply for asylum without taking the dangerous journey to the United States. Importantly, this program must not be paired with a ban on children applying for asylum at the border, as the administration recently tried to do. Finally, news broke on Friday that the administration is implementing its illegal “Migrant Protection Protocols”—otherwise known as “Remain in Mexico”—to keep asylum seekers in unsafe conditions in Mexico throughout the pendency of their hearings. Congress should mandate that no funds may be used to implement this plan. Even as the House and Senate conferees debate DHS funding, hundreds of thousands of Temporary Protected Status (TPS) holders and Deferred Action for Childhood Arrivals (DACA) recipients remain in limbo. Dreamers and TPS holders must not be used as hostages in any negotiation, as the administration has attempted to do again and again. Nevertheless, conferees should keep in mind that these individuals have been waiting far too long to be put on a pathway to permanent status and citizenship. Legislation that contains real border improvements and regularizes the status of Dreamers and TPS holders—though not at the cost of codifying the administration’s anti-immigrant policies—would be a major win for the nation. Tom Jawetz is vice president for Immigration Policy, Lia Parada is director for Government Affairs, and Philip E. Wolgin is managing director for Immigration Policy. The authors thank Sam Berger for his help.